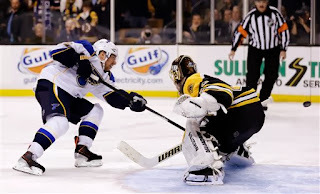 If you watched Thursday night's Boston Bruins game against the St. Louis Blues, you saw three great periods of hockey, followed by an exciting overtime, and a shootout that illustrates why regular season ties are meant to be just that, ties. To many hockey fans, a game does not necessarily need to be decided as a win or a loss, and a tie can reward both teams with a hard-fought game, and leave fans feeling entertained for two and a half hours. Regardless of the fact that postseason overtimes in hockey can be some of the most exciting moments to watch in all of sports, during the regular season it is not necessary to end a game with a gimmick or skill such as a shootout. After watching an entire game, it is more rewarding to see a team win on a hockey play, rather than on a part of the sport that resembles the skills competition of an all-star game more than anything else. Thursday night's game was a perfect example. With the Bruins and Blues tied 2-2 in overtime and 15 seconds remaining, the Bruins' Carl Soderberg had a breakaway opportunity to end the game, but the puck went into the pads of Jaroslav Halak. Having the game end on a hockey play like that would certainly have been entertaining, but staging a penalty shot in a shootout just does not have the same effect. Shootouts were introduced to the National Hockey League after the lockout and cancellation of the 2004-05 season. The league, looking for ways to improve the game from an entertainment standpoint, introduced several rule changes, one of which being the shootout. While shootouts may excite newer fans, and understanding that this is an audience that the NHL is focused on, traditional fans do not need shootouts to stay interested in hockey. Rule changes after the lockout such as removing two-line passes and reducing goaltender equipment by eleven percent made the game faster and higher scoring, and to the league's delight, appealing to newer fans. With the game unquestionably much faster and higher scoring than before the 2004-05 season, is the shootout really necessary? Aside from disappointing traditional fans, it also changes broadcast schedules, as the shootout lengthens the typical two and a half hour television time slot by about fifteen minutes. Returning the game to the way it was always played, before the shootout, would satisfy longtime hockey fans who remember when great evenly matched games would end in a tie, rewarding both teams, and leaving all fans feeling entertained. No gimmicks, no skill competitions, just 1 point for rewarding a team for what happened on the ice, not what happened in a shootout after the game.